LOCATION.--Lat 41`03' 34", long 76`05' 39", Luzerne County, Hydrologic Unit 02050107, on left bank 12 ft downstream from Harts Bridge on SR 3012, 2.2 mi southeast of Wapwallopen, and 3.7 mi upstream from mouth. PERIOD OF RECORD.--October 1919 to current year. GAGE.--Water-stage recorder and crest-stage gage. Datum of gage is 752.41 ft above National Geodetic Vertical Datum of 1929 (Penn Central Railroad bench mark). Prior to Mar. 15, 1930, non-recording gage at site 160 ft upstream and same datum. Mar 15, 1930 to Aug 8, 2018, recording gage at site 160 ft upstream and same datum. Satellite telemetry at station. 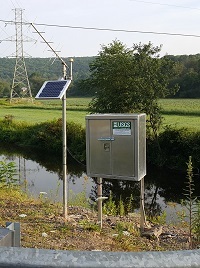 Supplied by USGS: Maximum recordable gage height (data transmitter operational limit) - 18.5 ft.